Vintage Poppy Seed Cake Pops with Buttery Poppy Seed Flavor | Bake This Cake! Old-fashioned butter cake and poppy seeds make for a delightful snacking cake – full of bright and rich goodness. This cake is perfect for morning brunch, an office coffee cake break or potluck party starring vintage cake goodness. And no frosting is required, although you could drizzle a simple lemon icing over top for added sweetness. My flawed personal experience with these seeds: I used to make a poppy seed cake using a muffin box mix (a true confession) because I love the taste of these nutty little seeds. But I was clueless about scratch cooking with poppy seeds or even where to buy them. Otherwise, I might buy a poppy seed muffin in a bakery or coffee shop. I had no idea how easy it would be to make a great poppy seed cake from scratch. And I never could have guessed how much better (um, WAY better) this cake tastes when it’s fresh from the oven using an old-fashioned butter cake recipe loaded up with this crunchy culinary spice. Its all about the star ingredient — baking poppy seeds. (No, even though California poppies (Eschscholzia californica) are the Official California State Flower, and they are adorable and delicate wild flowers, they are not the source for baking projects.) I tried different varieties of dark baking seeds starting with a whole little spice jar but then I graduated to larger quantities in order to test various cake recipes. I had to prepare ahead of time (a slight miracle for me) — by ordering a large bag of King Arthur poppy seeds on the web. It was so fun to open up a special delivery box of something so intriguing for a fun week-end of cake baking and testing. 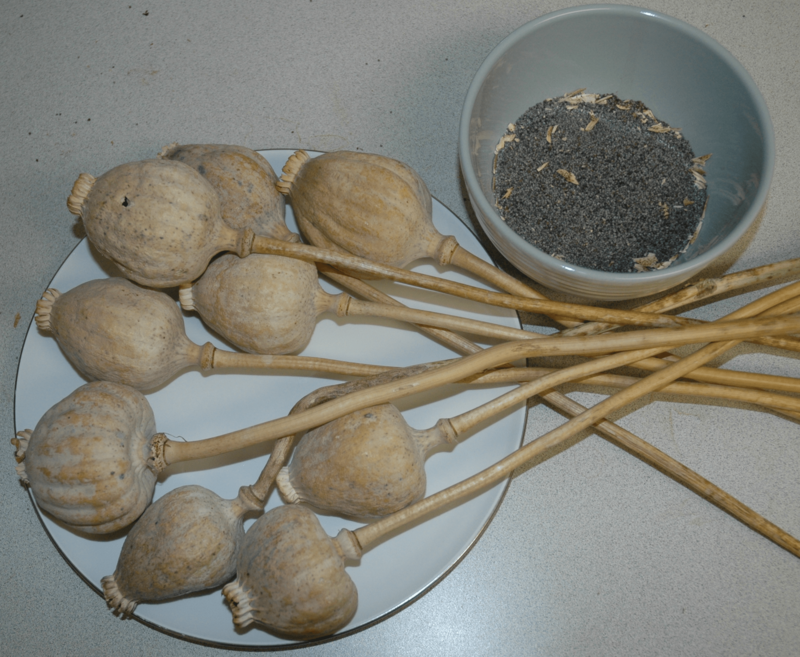 The ancient and mysterious seed: The poppy seed (harvested from the dried flower pod) has an ancient history. Think ancient, as in: the Minoan, Sumerian and Egyptian civilizations. And while I’m not so sure these mysterious little seeds match up to their historical lore (um, help with fertility or wealth or the power of invisibility? ), certain seed varieties are, in fact, great for baking cakes and muffins. You’re likely familiar with the blue-grey Dutch poppy seed you see on the spice racks in the supermarkets, though they could be cultivated in Turkey or anywhere in the Netherlands in a vast array of colors. Each little dark and crunchy seed snaps with a spark of nutty flavor. Vintage Cookbook Gold: We’re using an old-fashioned “Simple Butter Cake” from a well-used 1907 Lowey’s Cook Book (The Walter M. Lowney Co., Boston). But you could also use a nice Sour Cream Pound Cake recipe or a “Regulation” Butter Cake recipe (that is very buttery). In fact, many types of white or yellow foundation cakes work well for poppy seed cakes and muffins. Let me know in the Comments if you use a different vintage cake for your poppy seeds ’cause I just love vintage cake experiments. Okay, let’s bake this cake! Start by pre-heating the oven to 350 degrees and slathering a bundt pan with shortening to ensure (without fail) the easy removal of the cake. Tip: A good quality bundt pan is a good choice. Although I used a vintage copper bundt pan for this cake, they don’t seem to make many copper bundt pans like this anymore, although they make some nice varieties in heavy metal. That’s it! The poppyseed cake batter will show poppy seeds nicely incorporated throughout the batter. Except for the seeds, the batter will be a rich, thick creamy texture with a little golden color to it. Use a spatula or the back of a spoon to smooth the batter in the bundt pan and pop the pan into the preheated oven. Bake at 350 degrees for approximately 40 to 45 minutes or until the cake tests clean with a toothpick (or to an internal temperature of about 205 degrees). Tip: A slightly lowered center rack is perfect for this large cake. Cool the cake in the pan for a few minutes before flipping it over onto a cooling rack. It is fabulous warm from the oven. You may also want to drizzle it with a simple icing of lemon (or orange) juice mixed with powdered sugar as in the frosting recipe used for our Strawberry Pound Cake. Here’s the poppy seed cake fresh from the oven…all puffed up (almost twice the size of the batter)…ready to serve to waiting family and friends. This cake also travels well in the same pan. Let’s slice right into the hot cake and see what the innards look like, shall we? In fact, I think this old-fashioned wonder needs an immediate taste test, steaming hot from the oven. What do you think? And yes, it passes with flying colors! Thank you for joining me on our romp down the butter cake highway with the amazing ancient poppy seed. Now it’s your turn to bring a little culinary history to your own special kitchen with this cheery vintage cake. Hey Cathy, ha! I love your in invisibility wish. Looks yummy! Fun to read too ! That is so good looking and I love poppy seed cakes! Thank you ! Love poppy seed cake – was eating Austrian Moon Cake last week in Vienna – it was so delicious!! !